It’s hard to top a fine meal at Per Se, or is it? On the recent trip to New York, we stayed at a rented an apartment, a stone’s throw from Central Park. But we ate most of our main meals at Sister’s, two blocks away, and frankly, the volume of food that was prepared in a few short days was utterly mind-boggling. I figured I would just post a sample of the goodies we had over Christmas, to give you a feel… Up top, a Kuegelhof or gugelhupf, an Austrian Coffee Cake with almonds, raisens or dried fruit and lots of powdered sugar. 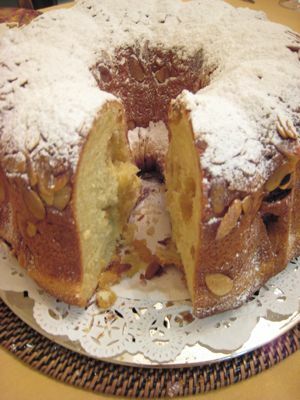 The raisens were pre-soaked in rhum, and she used a remonce (filling) of almond paste and butter. 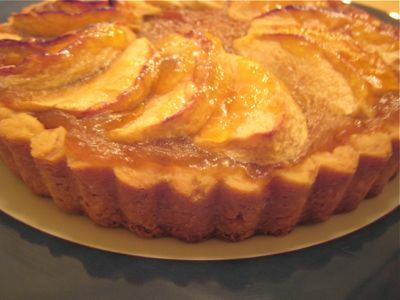 It was light, tasty and a great merienda item, enjoyed with coffee or tea. 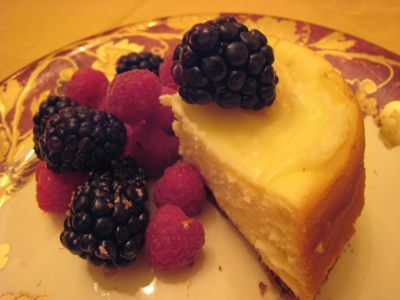 It sat out on the dessert table one day, inviting all who dropped by to just cut a slice to munch on… delicious. 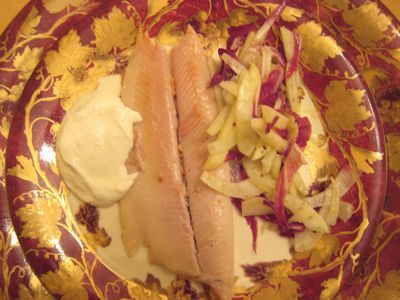 For another evening meal, dinner started off some smoked trout, with a creme fraiche and horseradish spiked sauce, and a side salad of thinly sliced fennel, green apple and radicchio with a mustardy vinaigrette. I love smoked fish and this one was moist and smokey… a perfect foil for the slightly bitter radicchio and bracing fennel and vinaigrette! 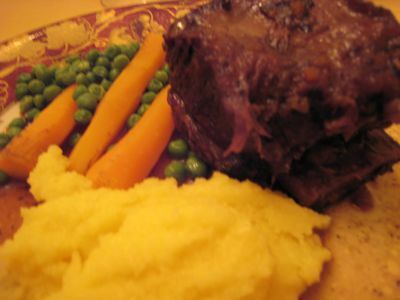 A slow braised pot of humongous short ribs (a Mrs. MM favorite) emerged from the kitchen and this was served with polenta, carrots and peas. The photo is horrific but I included it nonetheless because I was so stunned by the size of the short ribs! 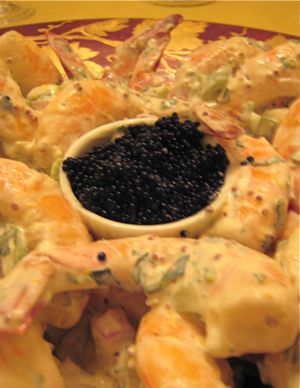 …a second platter of just shrimp in a creamy dressing and served with flying fish roe was the other choice that evening… yowks, I had double servings of BOTH appetizers! 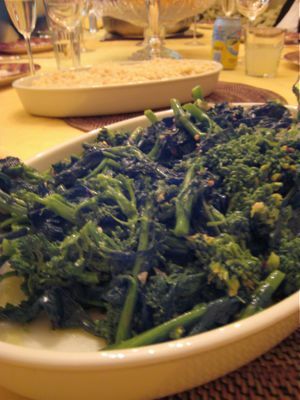 …while broccoli rabe and some risotto were served alongside. Uh, does Sister accept reservations? Her taste seems impeccable! Did she prepare all of the dishes herself? I guess the flair does run in your family. 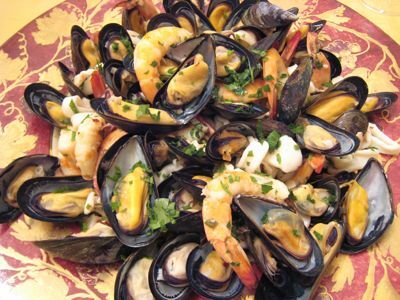 These are fantastic dishes, who cares about the photos! What a great way to celebrate the Holidays with family. …I am in awe at the fabulous dishes you prepared, sister!…and those desserts, I’m speechless!! !…I would consider it an HONOR if I could meet you one day. I told my wonderful husband that the first thing I would like to do after I get my knees fixed and am able to walk again is to go to NEW YORK! All I can say oh, ha, wow, amazing, fabulous, fantastic, marvelous, magnificent food, Chinaware, linen and stemware. Sister you blow me away! Sister is a woman of great form and packed with lots of substance. Sister your food is a real gala! Sister’s culinary talent is prodigious! 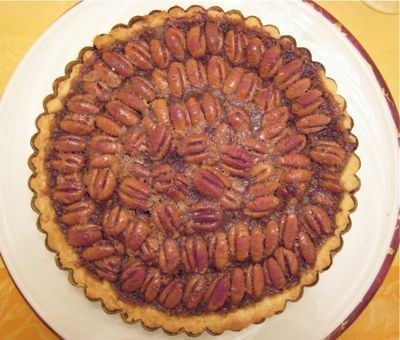 Did she bake the Austrian coffee cake, pecan pie and clafoutis herself? They are flawlessly executed. And I love the fall-themed China in gold and burgundy. Exquisite. wow, all the pics look good enough to eat! Reading and viewing the pictures of the beautifully prepared dishes has inspired me to start planning my next holiday dinner. did sister cook all the dishes by herself . . . including all those fabulous, magnificent, awesome etc etc desserts? ah! to have a sister like sister! Beautiful. From the choice of food, the dinnerware used. I’m guessing Sister is older than you, Marketman. You’re lucky that she takes care of you and your family well. Your sister is quite remarkable. Such taste & talent! Warm regards. 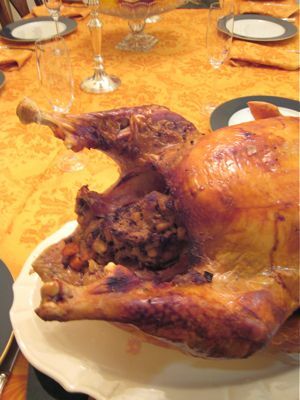 I agree that using fresh turkey makes a huge difference. I used a fresh, organic, free range, turkey (murray’s) last thanksgiving and it resulted in the moistest turkey minus all the chemicals normally found in good ol’ butterball. slathered lots of butter and cooked it breast side down. we’re not turkey people but my family (3 adults) managed to consume a 15 pound turkey and some of the trimmings in one sitting. it was that good. WOW. .. isn’t this a SUPERB meal!!! it’s all perfect. . . from appetizers to desserts. . . mmmmmmmmm, i miss pecan pie and smoked trout. . . forgive me because i eat the fish with tomato and onions. 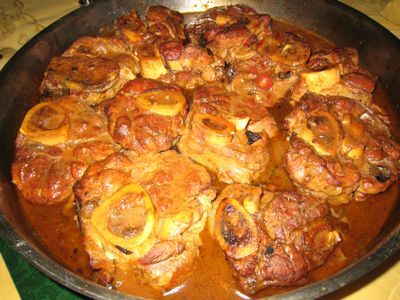 . . hehe just to feel like im eating tinapa when i dont have it, but i prefer this because its tender and juicy and i dont have to take off the bones. . .
I’m your long lost brother and I’m hungry. I am your long lost brother and I’m hungry. Sister, you’re something else. MM you’re so lucky! will work for food…at sister’s place. can you please sponsor me? good taste run in the MM family! Echoing dee bee: Sister, would you consider starting a blog? It’ll be my next best favorite after MarketManila! Hehe! MM,you are one lucky brother!!!!! I agree with dee bee, we hope that Sister would post more of her recipes more frequently here. In fact, whenever she makes her once in a while ‘appearance’ on this blog, I always read very well and digest her advices in cooking. P.S., Sister, you always give valuable inputs and I always read them well too!!! At this point, I haven’t read your post yet, I was just in awe looking at the pictures.. I could tell you really had a wonderful time.. I thought I could prepare a pretty decent meal for my parents, brother, and sisters, but looking at those pictures and reading the descriptions…..WOW, Sister, you blow me away! Sorry, are my eyes playing tricks on me? Single-handedly? Sister, you make me grieve about that. And if I remember correctly, MM, di ba you said Sister got sick just before you came? Makes it all the more incredible. Sister, IDOL!!! and it does make a lot of difference. last christmas though our NYorker chef made the best roast turkey I ever tasted and we never got bored making turkey sandwiches from the left over. love sister’s plate…. hello from the exumas…. MM, would you ask your Sister if she accepts homestays? heehee. Sister, you are an inspiration. Everything is beautiful! Brava! A sister’s love, what a great thing it is. Wouldn’t it be great if MM’s sister were at the next eyeball?! MM, maybe we can have a US eyeball at your sister’s place. I would be willing to fly to the East Coast just for that. MM, another great post! Sister, suspect you have superb organizational skills and the stamina of an athlete not to mention impeccable taste. Congratulations. sister — you are simply an amazing cook and hostess and a wonderful sister. may i call this “per Sis” ;-) really amazing food. And I thought I belong to a family of good cooks. Your sister is Amazing!!! I would pay to be invited to one of your family’s dinners. Okay, I can take the NRW train up, it’s a short walk. Be there soon!